Are you a “Swipe and Wipe” kind of person? “Who?” I know is what you are saying to yourself. A “swipe and wipe” er is a person that swipes a disinfecting cleaner of their shelf, sprays and quickly wipes it up. Then they leave thinking they’re protected by all the wonderful claims made on a the pretty product label. Well, you would be wrong to be so happy to be protected. Really, really wrong. kill claims have time identifiers on them. Make sure you check them before using. 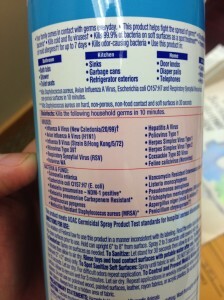 All products in the USA that make claims to kill bacteria, viruses etc are registered products with the EPA. Or, if they are not, they are being illegally sold (that’s another post though). 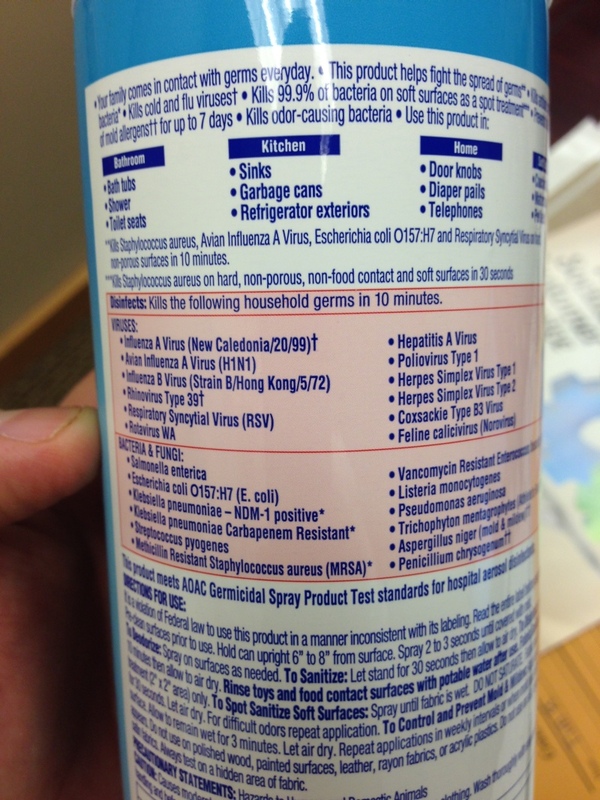 And in order to get an EPA registration number, these product need to spend a lot of time and money showing that they can, in fact, kill these viruses, bacteria and more. Once approved, their labels need to follow very, VERY specific words about what their claims can be. One of these is called a “kill claim”and will specifically mention “what” they kill and for “how long” it needs to be on in order to actually kill the virus. The image to the right has a very popular label. Note that the kill time to kill influenza is 10 minutes of contact time. 10 minutes. not 10 seconds, not 5 seconds and certainly not the 2 second that a “Swipe and wipe” cleaner does it. When you are setting up to clean and disinfect, and I mean really disinfect something, make sure that you always spend at least a minute looking at the label. It will help you identify the proper kill times as well as any cautionary statements regarding the product. For example, it will identify that you should not (or could) use it on food preparation surfaces. Or in hospitals. Or in HVAC systems…wait, what?? Yes, EPA has specifically provided label guidance on disinfectants and bacterial control products that are approved for use in HVAC systems. So, the next time you start cleaning anything check the label before you “swipe and wipe”. Oh, and by the way, I’m claiming #swipeandwipe right now.